Alps Mountaineering Zephyr 2 is a very special tent.It is ideal for hot muggy conditions.The interesting aperture with this tent is the entirely of the walls are made out of mesh lining,total ventilation is made possible. A cool breeze can drift through the tent creating a vortex of cool air. It’s free standing and can be set up in all types of conditions.The style of the tent’s poles also allows the tent to be set up at various angles and gradients. The tent area is 31 square feet, with an additional 17 square feet as a vestibule area, Totaling in 48 square feet of tent space for both you and your equipment. It can house 2 people plus all their gear comfortably. The depth of the vestibule is 28 inches which is more than enough to house the backpacks and camping gear that you will have. The highest point from the center is 3 feet, 2 inches which isn’t exactly high so consider that if you are a taller person with issues with bending down. 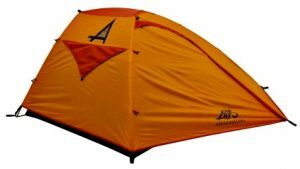 Alps zephyr 2 tent is comprised of a free standing 2-pole design with 700 series aluminum poles and each pole clip snaps over the tent poles for easy assembly. The factory sealed fly and floor seals mean that so matter how wet it gets outside, the inside of the tent will not get wet at all. The entire walks are made out of mesh, meaning when the weather is hot, you will be kept perfectly cool. The frame incorporated on this design is one of the most tried and tested in the business, more than half the tents of the market use it. Why is zephyr 2 tent so popular? Because it has stood the test of time. The 8.5 mm 7000 Series Aluminum poles used are quite simply the best in the business. They are designed specifically to withstand all types of weather conditions and temperatures; the frame also incorporates stakes and guys for stability during heavy storms. This is your ultimate backpackers tent. Your rugged environmentalist survivor would use this tent. The mesh walls make you one with nature, you can lie back and see the stars at night and with the fly material attachment you can be protected from the rain too. It isn’t the biggest tent, but the type of person buying this tent doesn’t need a lot of creature comforts they are hard nosed and used to things getting a little rough and rugged in the wild. After a long say of hiking you can throw your dirty equipment and boots into the vestibule storage and not worry about them as you enjoy the comfort of your dry, cool tent. Zephyr 2 tent offers a dark yellow and orange design mixed in to create a wonderful design. The interior walls as mentioned are made entirely out of mesh meaning that they are black and completely see-through. This is to be expected but the fly colors material available are dark yellow and orange which offer primary color bases that you will be able to spot from a distance. If you are looking for your tent away from camp or you get lost and need a focusing point. The mesh walls mean that this tent is awesome for hot weather- cool breezes are allowed through the entire tent which keeps everybody at a comfortable temperature. It has a rugged design with simple, usable frames so it can be erected almost anywhere. Alps mountaineering zephyr 2 tent: One of the best 2 person tent for 3-season purposes. The mesh walls have a downside, if it rains at night and you don’t have the fly material up, you are going to get wet. Full coverage of the nets is needed to be completely assured of dryness which eliminates the cool breeze of the mesh. The fly material can be a little tricky to attach, especially in poor weather conditions. Alps zephyr 2 review seems great, especially if the focus is on hot or humid weather. However we do come in to some issues when the weather deteriorates. Unexpected rain showers or storms mean that the tent and everything/everybody inside it who is not protected will get wet. You can attached the fly cover material but in heavy rain it will already be too late. Your options become either. Be cool and wet or hot and dry. Thanks for reading Alps Mountaineering Zephyr 2 Review here!